A recent study by Quantum Workplace shows that employee engagement has hit an eight-year low. One-third of employees show up for work but are not fully there. Some studies show closer to 50 percent. One blogger calls them “the working dead.” Understanding why many are sitting on the sidelines is vital to your organization’s success. A 2013 article in Fast Company estimated the cost of employee disengagement to the U.S. economy at roughly $370 billion a year. Why are people detached from their jobs, their bosses and each other? Business is about relationships, working together and communicating. When relationships break down or never get started, employees withdraw. Research shows that people leave their managers and supervisors, not companies. A focus on training and development around Emotional Intelligence (EI) is a good place to start building and improving professional relationships—thereby enhancing employee engagement and performance. Research shows that EI is a key driver of how people relate to each other—how they get along. Misreading behaviors can result in emotionally-charged encounters which impair performance, communication and decisions. In his book, The Stress Effect: Why Smart Leaders Make Dumb Decisions—And What to Do About It (Jossey-Bass, 2010), Dr. Henry L. Thompson states, “Emotional Intelligence begins by being aware of emotions and then managing and controlling them.” This is important because emotions carry information, social cues and insights into what’s going on. Improving EI increases your awareness of emotions and your ability to respond appropriately to what they tell you. Make a lasting and positive impact in your workplace by developing your EI skills. Start with a scientifically-validated and well-known EI assessment like the EQ-i® 2.0. Certification on the EQ-i will prepare you to introduce EI concepts into your company or with your clients. EI training will improve vital skills like decision making, the ability to cope with stress and the ability to relate to others. This leads to more employee engagement and better performance all around. Create EI awareness and provide skills-development opportunities to increase your organization’s capacity for success. 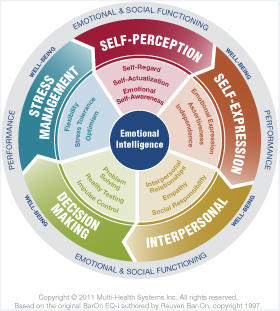 The EQ-i 2.0—the most scientifically-validated Emotional Intelligence assessment available—measures the interaction between a person and his or her environment. The power of the instrument is in how the five Composite Scales and fifteen Subscales pinpoint a person’s behaviors and the motivations behind those behaviors.